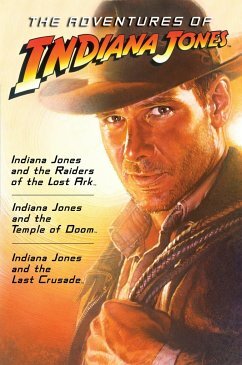 FOR THE FIRST TIME IN A SINGLE VOLUME-THREE THRILLING NOVELS INSPIRED BY THE BLOCKBUSTER FILMS This volume includes the following novels: Indiana Jones and the Raiders of the Lost Ark Indiana Jones and the Temple of Doom Indiana Jones and the Last Crusade With bullwhip in hand, Indiana Jones has unearthed a wealth of ancient treasures. In Raiders of the Lost Ark, the fearless archeologist journeys from Nepal to Cairo to the Mediterranean, dodging poisons, traps, and snakes, battling rivals old and new-all in pursuit of an ancient artifact that holds the key to dazzling, invincible power. Indiana Jones and the Temple of Doom finds our intrepid hero in a remote village in India, where a mysterious old shaman tells him that his arrival has been foreseen-and that he must retrieve a stolen mystical stone. And finally, Indy must face the most challenging and personal endeavor of his life: rescue his estranged father, the eminent professor Dr. Henry Jones, from a Nazi's lair, and recover the legendary Holy Grail. Yet Indiana Jones and the Last Crusade doesn't mean the adventure is over. . . .